This is a custom mod based off of the JumpPad mod made by Pfaeff. It adds a good bit off functionality to Pfaeff’s jump pad, plus a whole lot of other features! Now you can launch any mobs 5, 10 or 15 blocks into the air. Jump Pad – This is the upgraded version of Pfaeff’s jump pad that I take no credit for. Launches any entity 5 blocks into the air. Light Detector – This simple detector will emit a redstone signal that correlates w/ the light level in its vicinity. A great alternative for those who traverse dimensions that usually do not offer daylight! Jump Pad+ – An advanced version of the jump pad that can launch any entity 10 blocks into the air. Jump Pad++ – An advanced version of the jump pad+ that can launch any entity 15 blocks into the air. 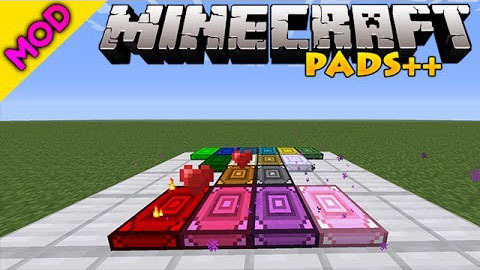 Portal Pad – Behaves like a miniature Nether portal! Incineration Pad – Incinerates any entity that touches its top! Speed Pad – Has a surface of minimal friction that propels any entities quickly on its surface! Slow Pad – Reduces the speed of any entity! Acceleration Pad – Sets a player to a sprint when walked upon! End Pad – Teleports a player to the End dimension! Annihilation Pad – Deals direct damage to any living entity that crosses its surface (a better alternative to the Incineration Pad, if you wish to keep your drops!). Impact Landing Pad – Absorbs any entity’s fall, preventing any fall damage (inspired by Cheezy WEAPON’s recommendation). It does have its limits though, so be careful! 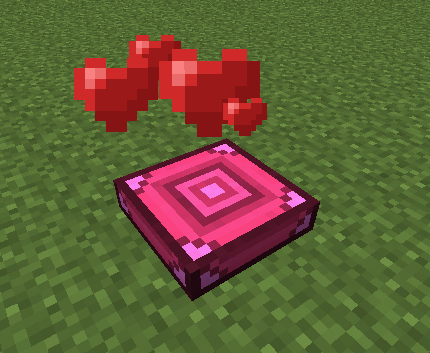 Ballistic Pad – Explodes whenever any entity touches its surface (what’s a great mod w/out explosives?)! Regeneration Pad – Regenerates 1/2 of a player’s health and hunger when collided w/! Booster Pad – Behaves just like the Jump Pad, but allows a player to pass through the bottom of it (inspired by Cheezy WEAPON’s recommendation), and adds a block of extra jump height! Sneaking will allow a player to pass through it w/out being launched! Aqua Pad – Harnesses the usefulness of water! On fire? The aqua pad will extinguish you! Hate cauldrons and want an efficient means of having an infinite water source? The aqua pad will provide it! Need to rinse off your dyed armor? That’s no longer an issue!